Mexican Sinaloa cartel leader Joaquin “El Chapo” Guzman escaped from the Altiplano Maximum Security Federal Prison over the weekend. The prison was designed to house high profile criminals and had been reviewed by international agencies in order to verify that the facility could securely hold the drug lord. He had been constantly monitored by video cameras and the last security video footage was on Saturday the 13th, before he stepped into the prison showers. Guards noticed his cell was empty from the video feed and went to check the showers. The showers were empty and there was an opening on the floor with steps down a 13 ft. vertical shaft that lead to a tunnel. The height of the tunnel was sufficient enough for Mr. Guzman to walk upright through the almost mile long passageway. It was properly ventilated and illuminated with electricity. The end of the tunnel led to a construction site located in the middle of a field. The structure was made up of cement blocks and empty except for a stove and some clothes. Nearby residents explained that the house was built within a year and very quickly. One report says that it was an illegal construction. Once authorities realized Mr. Guzman had escaped, they closed roads and airports, including Toluca International Airport. Mexican authorities informed border officials within Guatemala of the escape and provided a copy of Mr. Guzman’s photo. Media outlets have reported that some believe Mr. Guzman must have had assistance by people high up in the prison. Some guards have been sent to Mexico City for questioning after the escape. 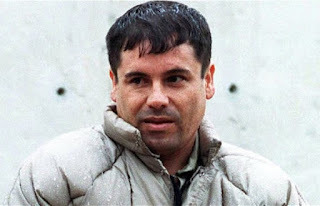 Online articles explain that the Sinaloa cartel has a lot of experience in building drug smuggling tunnels and with Mr. Guzman’s wealth, funding an escape would not be a problem. This is the second time Mr. Guzman has escaped from prison. He escaped in 2001 from a Jalisco prison and had eluded authorities until 2014. He was recaptured in Mazatlán by Mexican authorities. The U.S. has expressed its future cooperating in helping the Mexican government to find “El Chapo”.